We were delighted to hold the iMlango Junior Debaters Contest - Competition one prize-giving ceremony at Kibaokiche primary school in Kilifi county this month. The top three placed groups were in attendance at the ceremony, with first place coming from Kibaokiche, and second and third place from Kasidi primary school. 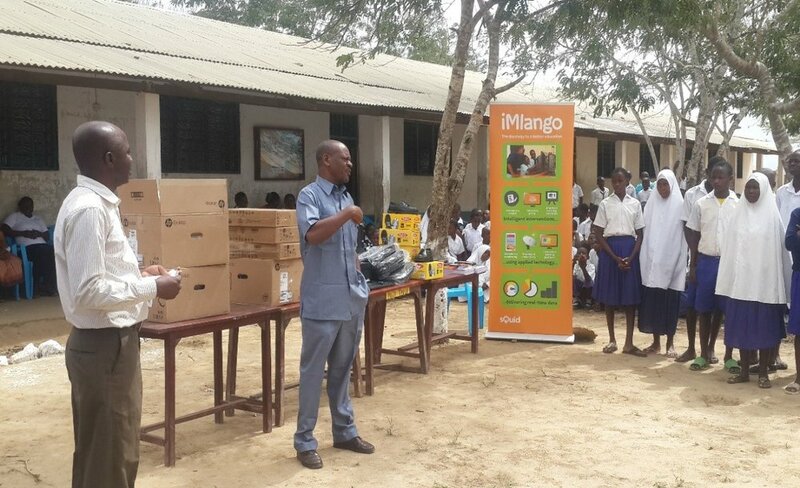 Both schools are located in Kilifi. Champions group receive their prizes. The winners of competition one, Champions, received three computers, Oxford geometric sets, pens, pencils, rubbers, exercise books, story books, shoes, and school bags. A raucous crowd of their school-friends cheered them on as they were awarded their prizes. "I am very grateful for the gifts that iMlango have given to us, they will not only help us as we do our Kenya Certificate of Primary Education examination, but will also help us as we move onto form one.’’ Zainabu added that the contest had helped improve her grammar, and English performance. And according to the rest of the group, the secret to their success was cooperation, as this taught them that teamwork is an important life skill. "The awarding of the Champions group and the school has raised the interest of other pupils to participate in the contest, as they have seen what their schoolmates have been awarded. We are also grateful for the added computers and the teachers are ready to give full support to the project." In the ongoing iMlango Junior Debaters Contest - Competition two, four groups from Kibaokiche have made it through round 1, with Champions achieving the highest score of the round with a fantastic 82%. They are supremely confident after their success in competition one that they will now go onto win competition two! Headteacher (left) Mr Geresa Motto, and Community Support Officer of Mariakani (right), Mr Chimbungu Mwarumba address pupils and congratulate the winning group. From Kasidi school, the Zion group took the runners-up spot and the Lions group came third. The groups were awarded a combination of the aforementioned prizes, but did not include computers. 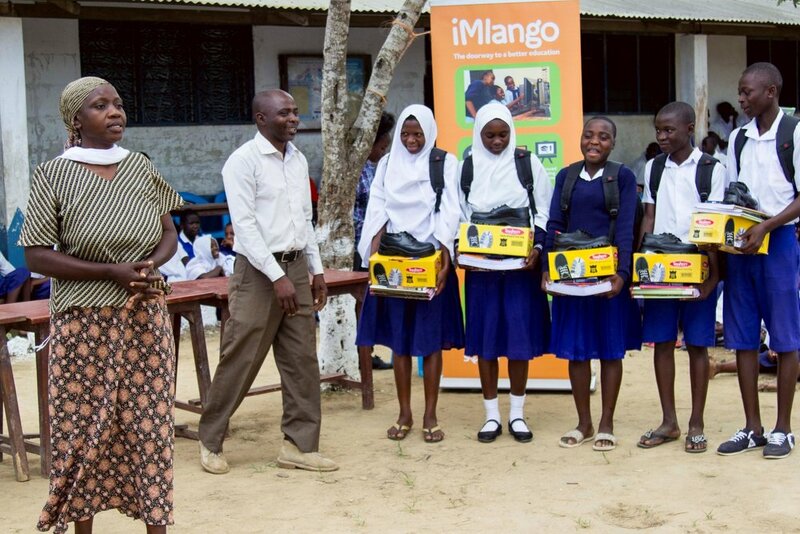 During the award ceremony, Mr Balozi Juma, an ICT teacher at Kasidi, talked about iMlango's impact, advising that the learning platform had changed girls’ perception of education, improved their self-esteem and confidence, and had helped them learn how to handle life's challenges. The Zion and Lions groups from Kasidi primary school. It wasn’t just the top three groups who advised that they enjoyed and learnt through participating in the contest. Kombe, a student from the Blue group in standard 6 at Vishakani primary school, said that the contest had helped him improve writing compositions, as he learned how to construct full sentences, whereas it had helped David from the same group to learn how to read sentences fluently without stammering. Schools such as Mwandodo and Vishakani who participated in the contest but did not make it into the top three places, said that the award ceremony had motivated and challenged teachers to improve their pupils' performance. Madam Happy Katana, ICT teacher at Mwandodo, said that in the coming rounds they will 'encourage and guide their pupils well' so that they will become winners. Older PostiMlango sponsors the upcoming 7th Annual mEducation Alliance Symposium in Washington D.C.